We’ve Got Spirit, How ’bout You? Can you believe it’s August already? Though as it’s expected to hit 110 degrees here in Lawrence today, I’m looking forward to fall and cooler temperatures. And speaking of cool, we’ve got some cool ideas for showing your school spirit this fall. While CamelBak and Nalgene Water Bottles remain among our most popular water bottles, we also offer a great new line of sleek and durable water bottles. Made from BPA free Tritan Copolyester, these bottles are available in a variety of beautiful colors and styles. And replacing disposable plastic water bottles is eco-friendly. While we’re talking water bottles, we might as well show off some of our popular aluminum and stainless steel water bottles. Available in many colors, shapes and sizes, these bottles are an excellent alternative to plastic water bottles. A great giveaway at pep rallies or to use as a school fundraiser. 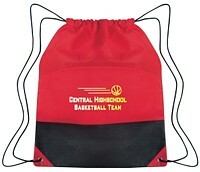 A great choice when promoting school spirit, drawstring backpacks are ideal for sports teams and youth groups. Many backpacks are available in non-woven polypropylene, making them eco-friendly and recyclable. Available in many colors and styles. The backpack featured here is the Non-Woven Two-Tone Drawstring Sports Pack. This pack is made from 80 gram non-woven, water-resistant polypropylene, and features an outside pocket, reinforced eyelets and drawstring closure. Available in red, apple green, orange, purple, yellow, blue and forest green. Is your team number one in your heart? Let everyone know how you really feel with foam fingers and foam cheering mitts. Available in many colors, sizes and shapes, foam cheering products are a great way to make a big impression. Includes a hand slit for easy cheering. You’ll have your opponents shaking in their boots once they realize they’re playing number one! While I love watching football, I’m not a fan of the bleachers without my trusty stadium cushion! 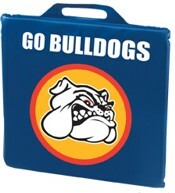 A great way to promote your business and your team spirit, print your logo on one side and your mascot on the other. Great for pep rallies or as a school fundraiser, stadium cushions will keep your fans comfortable while they cheer on their favorite team. Available in different sizes, styles and thicknesses. I prefer mine as thick and soft as possible. Whether your team consists of your staff or your football team, apparel is a great way to display your school spirit. We offer both screen printing and embroidery on a wide range of items including t-shirts, polos, hoodies, boxers, sweats, headware, shorts, wind jackets and much more. Pictured is the Gildan Heavy Blend Fleece Hoodie. Made from a 50/50 cotton/polyester blend, this 7.75 oz. brushed back jersey fleece includes a hood neck with drawstring, front pouch pocket, spandex reinforced rib knit cuffs and waistband, double-needle cover-stitched armholes, cuffs and waistband. This is only a small sampling of the products that can be used to show your school spirit. Let your imagination run wild, or better yet, let ours. We’re brimming with fresh and creative ideas for your next promotion or event. Woke up this morning and checked out the forecast. It looks like we’ll be in the ’90s again today. Yikes! Now that we’re officially in summer, we have a few cool products to recommend for your next promotion. Available in a many great colors, beach towels are appreciated gifts. Your clients will use them for years to come. My favorite beach towels are the 70″ x 40″ heavyweight towels that are decorated with a tone on tone technique. They’re stylish, durable and effective promotional gifts. Very nice indeed. 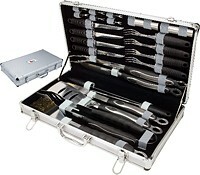 Ideal for company picnics or just a unique summer promotional gift, BBQ sets are a personal favorite of mine. They come in all shapes and sizes, from a practical 3-piece set wrapped in a nylon bag to this awesome 24-piece Executive BBQ Set which includes a beautiful metal case. Makes my head swim just thinking about this arsenal of BBQ-ing utensils. Or combine a BBQ set with a custom decorated BBQ Apron and you’ll make any grill master flush with excitement. Fun at the beach, the lake, the pool or virtually any outdoor event, promotional beach balls are a cost-effective giveaway and a classic summer favorite. Available in a variety of sizes and color combinations, let your imagination run wild. 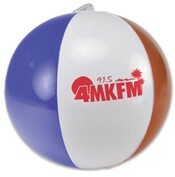 One of our most popular summer promotional items. 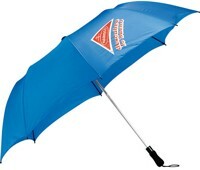 Promotional umbrellas can stop the rain or protect you from the sun. And this year in Kansas, we’ve already needed protection from both. Umbrellas come in a variety of sizes, and virtually every color combination imaginable. Mini umbrellas are a fun giveaway and can easily fit in a briefcase or glove box. Standard sized umbrellas are useful fundraisers and can be sold at outdoor events. And if you’re sponsoring a golf tournament this summer, the 60″ golf umbrellas provide a huge imprint area for your logo and promotional message. Remember that not all umbrellas are created equally. My personal favorites are Stromberg Umbrellas. They’re very well constructed. Are available in many great colors, sizes and styles. And can be decorated with your logo. Traditionally used during the summer, promotional sport bottles have become popular year round. And talk about variety — there are tons of options for materials, styles, sizes and colors. Nalgene Bottles and Camelbak Bottles are BPA free and are made from an incredibly durable material called Tritan copolyester. Soft-sided bike bottles have followed the trend towards BPA free materials, and are now typically made from recyclable PET. Aluminum bottles are light weight, competitively priced, and carry a high perceived value. And if you want the cream of the crop, stainless steel water bottles are durable and stylish. Custom flyers are among our most popular summer promotional items. They come in several sizes and tons of great colors. The most popular size is the 9″ flyer, but my favorite is the 117 gram 9.625″ Ultimate Flyer. It’s heavier and more durable than other promotional flyers and is available in an eco-friendly option made from 100% home recycled material. Other options include a Dog Safe Ultimate Flyer, Foam Flyers, Glow-in-the-Dark Flyers, Collapsible Flyers and Fling Rings. Koozie remains the premier line of can coolers, and the Original Koozie Can Cooler is still our most popular style. Made from high-quality durable foam, the Original Koozie can maintain your beverage can at 40-degrees or below for 35 minutes. Koozie offers a broad line of can coolers including Collapsible Koozies (ideal for mailings), Metallic Reflections Koozies, Koozie Jersey Can Coolers, Metal Koozies and a cool Football Koozie. But we don’t stop there. Another popular style of can cooler is the Neoprene Collapsible Can Cooler. Neoprene is a scuba-like material that insulates well and is very durable. Help your customers protect themselves from the harsh rays of the summer sun with promotional sun screen. One of our most popular styles is the Shady .5 oz. Carabiner Bottle. Your choice of SPF 15 or SPF 30 sun screen, this product is both water-resistant and sweat-resistant. 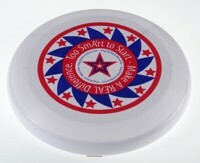 A smart promotional giveaway. From a simple insulated lunch sack to a rolling insulated cooler with a 34″ extending handle, insulated bags and totes make great promotional gifts. With prices that range from a couple bucks to $50 each, you can find the right style to fit any budget and promotion. One of my favorites is the Koozie Kombo Kooler. This combination backpack and kooler is ideal for sporting and recreational activities. The mesh upper compartment and spacious lower compartment makes this bag very user-friendly. Available in red, blue and black. Fall is quickly approaching. And with Fall comes time for School Spirit! The smells of tailgating. And the sounds of crazy fans at football games. Included here are ten of our most popular School Spirit Items. These can all be custom imprinted with your team’s mascot or company logo. 1. Megaphones are excellent giveaways at games or rallies. Some are available with caps so that they can be sold filled with popcorn. 2. Sports Pennants are popular giveaways and are typically displayed with pride for many years. 3. ThunderStix Noisemakers offer an effective way for your fans to make a lot of noise. Blow them up, bang them together, and intimidate the other team. 4. Nalgene Water Bottles are our most popular drinkware items, and are great to display school spirit or for fundraisers. Other popular Sports Water Bottles include Camelbak Bottles and the very popular Aluminum Sports Bottles. 5. Football games can seem long when sitting on those hard bleachers. Make your fans comfortable with Stadium Seats and Stadium Cushions. 6. For some protection against rain, make sure you’ve got Rain Ponchos imprinted with your school’s mascot. 7. Whether you choose the dense foam footballs, plastic replica balls or authentic leather footballs, Sports Balls are ideal giveaways at rallies and other outdoor events. 8. Pep Rags and Rally Towels are great to wear, and great to wave. Available in many colors and styles. 9. How can your team ever be number one unless your fans are equipped with Foam Number One Hands. 10. Plastic Stadium Cups are perfect for concessions, and your fans will collect them.